The menu this month, is a classic pairing for pan fried chicken, consisting of collard greens, mashed potatoes, pan gravy, and warm buttermilk biscuits. You’d be hard pressed to find a place in the South that serves fried chicken without these sides, if they don’t be sure to lead them to us. Here are the rules: 1) the chicken has to be fried in your cast iron skillet, no deep frying; 2) lard or crisco only for frying, leave your scented olive oils and canola in their respective bottles, you’ll thank us later; 3) mashed potatoes and biscuits have to be made by hand, don’t even think about that stuff that comes from a box 4) gravy should be made from scratch, nothing out of a packet and 5) you have to use a whole fryer chicken, learn to quarter it yourself (it’s simple to do & cheaper than buying it broken down). You’re going to be busy with that cast iron skillet, so no need to attempt to cook it all in one pan. Here are a few tips to help you conquer this classic Southern meal. Quartering a chicken is very easy, just focus on following the joints and the lines of the bird, and be sure to use a flexible knife. 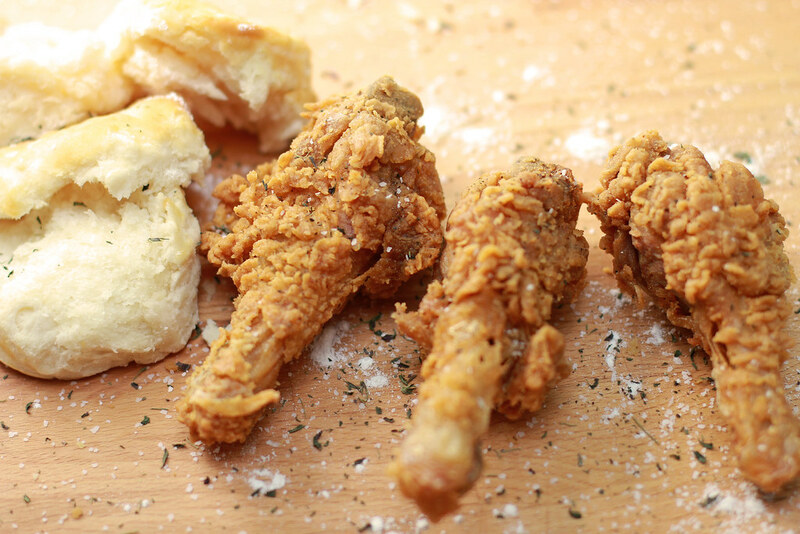 There are lots of recipes for fried chicken, but if you choose buttermilk fried chicken, be sure to soak the broken down pieces in seasoned buttermilk for 24 hours, you’ll be blown away by the results. Make sure you’re using a thermometer in the pan to know what your oil temp is, it’s the key to frying success. After you’re done frying, be sure to season while hot, and allow the chicken to rest on paper bags to absorb any extra grease. When boiling your potatoes make sure you bring the potatoes up to a boil in the water, not adding them after the fact. Don’t forget to reserve some of the frying fat and crispies from the chicken for the gravy, that’s where all the flavor is. Finally don’t forget the sweet tea. Readers don’t forget to give the challenge a shot for yourself . Each month we give away some great prizes to the best attempt. This month we’re giving away a Calphalon Contemporary Non-Stick frying pan, one of our newly designed Hungry Southerner T-Shirts, and a Southern Starter Kit including some great local products like moon pies and stone grits. Just fry up your best Southern Fried Chicken, take some pictures and post it to our fan page telling us how it went. We’ll vote on the best attempt at the end of the month, winner take all! Don’t forget to head over and offer Caitlin, “The Yankee” , your best fried chicken recipes and secrets. Stay Hungry Y’all! Tomorrow is the big day – this time I have the biggest audience of all Yankee Challenges. Ah well, I grew up in the South, but will probably not use the cast iron skillet today.